Rinse fish, cook rice, and chop vegetables. On each foil square, spread half of the rice. Layer the bok choy, fish, and scallions on the rice. In a bowl, mix the sauce ingredients. Pour sauce over the fish. Fold up the foil packets and bake 20-25 minutes. Cooking in the foil steams the fish and makes cleanup really easy! Kids like tilapia–it’s a very mild white fish and there are no bones to worry about. I can often get tilapia for $3.99/lb, and 1 lb. works for our family of five. It’s basically a complete meal all in one: fish, grain, & veggie. I serve some chilled mandarin oranges for dessert. For more of my family’s favorite recipes, head over to my Recipes page. 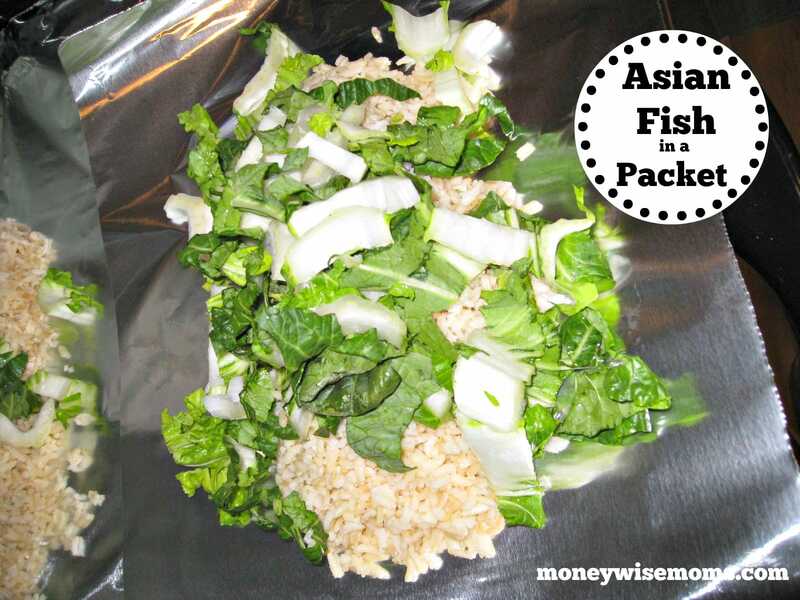 This Asian Fish in a Packet recipe is linked up to The Gluten-Free Homemaker. This looks great and so easy! Thanks for the recipe!